The Elemental HEROes were known for one key aspect – Fusion Monsters. Let’s revisit Fusion Summoning with new support options and a new mindset! example, let’s talk about their ridiculous number of Fusion Monsters: 59 in total. (2 Destiny HEROes, 3 Vision HEROes, 9 Masked HEROes, 38 Elemental HEROes, 6 Evil HEROes, and 1 Contrast HERO, not to mention Rainbow Neos and Destiny End Dragoon). In fact, the HERO archetype is the second largest archetype in the game, only being surpassed by the “Number” archetype. Back in their heyday, HERO decks were a common sight at the competitive level, especially with the rise of Elemental HERO The Shining combined with the Gemini, Elemental HERO Neos Alius. But nowadays, many duelists who want to use HEROs turn to the ‘fake’ Fusion monsters, the Masked HEROes, that do not require use of Polymerization. So let’s return to the basics and break out our good old Fusion HEROes, and see just what they can do. might need. There is also one other key aspect that makes HEROs worth it: the ability to gain card advantage like crazy, with the added potential of OTKs out of seemingly nowhere. Now, you’re probably thinking that these monsters have been around for quite some time, and have yet been effective at cycling through Fusion monsters to eventually win the duel… and that is a solid point. But the new new HERO support cards in the Duelist Saga set releasing in March for the TCG, the strategy will be getting a couple new cards to enhance their strengths even further. So let’s begin by answering one question: What does an Elemental HERO fusion deck bring that a Destiny HERO deck does not? (Note that the last Fusion-based article I contributed was based around Destiny HEROs, so if you’re interested in what I had to say about them, check out this article: LINK). many of the same key Fusion monsters. Monsters like Vision HERO Adoration and Vision HERO Trinity offer the same exact benefits to both decks. While Destiny HEROes have their two archetype-branded Fusions, Dystopiaguy and Deadlyguy, the Elemental HERO have a plethora of options to choose from. In today’s build, we will be primarily using the Elemental HERO fusions that can be Fusion Summoned without requiring specific materials, colloquially known as the ‘Omni-HERO’ Fusions. These Fusion monsters can be summoned using a HERO + a monster sharing their attribute, thus it they are intended to be much more flexible than the traditional Fusion monsters that require two specific materials. So the Extra Deck lineup for the two archetypes is a main point of contrast, but what about the Main Deck? Summons. Elemental HERO Blazeman searches out your Polymerization as needed and Elemental HERO Shadow Mist offers the search power necessary to offset the inherent costs of performing a Fusion Summon. As stated during the D-HERO article, the amount of search options to get to Blazeman to then get Polymerization is absurd, and that long list of routes has increased due to new cards revealed since the publishing of that article. Now, we have a couple of new additions that make the job even easier. Fusion Recycling Plant, a TCG World Premiere debuting later this month, adds a Polymerization from your Deck or Graveyard at the cost of a discard, and Vision HERO Vyon lets you add one from your Deck at the cost of banishing a HERO from your Graveyard. Just like the Destiny HERO deck, the Elemental HERO deck doesn’t need to worry one bit about getting to their Fusion Spell. So what are the main differences between the cores of each strategy? abuse the Graveyard effects of the monsters you use as Fusion Material, treating them as an investment in your future. For Elemental HERO variants, you make up for the loss in advantage with the HERO effects on the field in tandem with additional Fusion Summons later on using your Fusion Material monsters for a second Fusion using Miracle Fusion. The other option is the new HERO Spell card debuting in March – Legacy of a HERO. Consider this card a themed Pot of Avarice for HERO decks, but you only need to return 2 HERO Fusions back to your Extra Deck and you get to draw 3 cards. Sure, this card requires the setup of actually completing some plays, but when you factor in the ease of Fusion Summoning multiple times in the same turn, its condition(s) for activation occur more often than you might expect. Therefore, these two strategies are truly distinguished by the tools from the Extra Deck at their disposal, and the existence of potent Spell support options. rolling over their monsters, because Trinity doesn’t start a chain with any of its effects and summon-triggered traps such as Bottomless Trap Hole have definitely fallen out of favor in this age of requiring decks to get past established fields in order to continue playing. Finally, remember that you are running primarily Level 8 Fusion monsters. It never hurts to choose to Fusion Summon into multiple monsters just to overlay into a Rank 8 Xyz monster, such as Number 38: Hope Harbinger Dragon Titanic Galaxy. If your opponent succeeds in defeating your dragon, you will be ready to return both Fusions back to the Extra to draw 3 cards and get right back to where you started. Thus, the Fusion HERO strategy is extremely flexible and elastic – it can bounce back from losing everything it established on the previous turn to get monsters back onto the field. to be an extremely passive duelist. With the arrival of the second new card from Duelist Saga, Elemental HERO Honesty Neos, you can actually choose to simply rely on Elemental HERO Ocean as a solitary solider to hold down your monster zones. Most opponents do not like to waste their resources to spin, bounce, or remove a Level 4 1500 ATK monster from the field, and Ocean can continuously add back HEROs for each turn that it survives. Honesty Neos just gives it more of a punch in order to survive those situations. Otherwise, Honesty is just another piece in the OTK puzzle, giving you a LIGHT monster that can be relied upon as a solid monster to run in the deck to gain access to Elemental HERO The Shining, without running an effect-less Gemini like Elemental HERO Neos Alius like Fusion-based HERO decks in the past resorted to. By this point, you should have a pretty good idea of the strategy behind Fusion HERO, but let’s just lay out some potential play patterns to demonstrate just how flat of a deck HERO can truly be. All of the following opening hands were randomly generated in order to explain the play patterns depending on what you started, using the build contained in the Sample Deck Recipe contained later in this article. Note, these hands are expecting you to lose the diceroll and be forced to go second, which is historically and theoretically a harder position to fight back from. You can start by searching out Blazeman with Call; Normal Blazeman, search Polymerization. Fusion Summon Vision HERO Adoration using Shadow Mist and Voltic in your hand, then use Mist’s effect to add a second Blazeman to your hand. Next, use Miracle Fusion to Fusion Summon E-HERO The Shining using the two HEROes now in your Graveyard. End Result: 7200 points of damage on your field with Honesty Neos in your hand and an opponent’s face-up monster reduced by 3200 ATK points due to Adoration. (Then changed into a Number 38 in MP2). In your hand would be Foolish Burial (to send Shadow Mist and search a HERO if need be next turn), a Blazeman to search another Poly on the subsequent turn, and Honesty Neos unless you used him going for the OTK. This is one terrible hand. Start by summoning Blazeman, then using his second effect to send Shadow Mist to the Graveyard. Shadow Mist then searches out a HERO of your choice. You could then Fusion Summon twice, into Adoration and Elemental HERO Escuridao and end with 5800 points of damage on the field. (Eventually going into Number 38 afterwards). Your other option is to Fusion Summon Trinity, and potentially OTK if your opponent left enough monsters on the field in ATK. This hand didn’t really offer too much potential. Vyon, sending Shadow Mist from your deck to the Graveyard. Mist then activates, adding Honesty Neos to the hand. Use Vyon’s effect to banish Mist to add a second Poly to the hand. Fusion Summon The Shining, using Neos and the Blazeman on your field. Fusion Recovery back the Poly used and Honesty Neos. Fusion Summon a second time, this time for Adoration using Honesty Neos and the Blazeman in your hand. Next, Fusion Recovery back Honesty and Poly. Then, Fusion Summon a third time using Vyon and the Blazeman to summon Escuridao. End Result: 8400 damage on your field (Adoration and Escuridao to be turned into a Number 38 in MP2), Honesty Neos, Poly, and a Legacy of a HERO in hand that will be ready to be activated on the next turn if Number 38 falls. (Bonus is if your opponent sends Shining to the Graveyard without it missing timing, because then you get Shadow Mist back to the hand as well!). Summon Blazeman, add Poly to hand. Fusion Summon Elemental HERO Nova Master using your Blazeman and Shadow Mist. Then, use Shadow Mist’s effect to add any E-HERO to your hand. If you can attack and destroy an opponent’s monster in battle to draw a card, that’s great. But even if you cannot, the end result is still Nova Master and a set Call of the Haunted on your field, and Summoner Monk, any HERO, Foolish Burial, and E-HERO Honesty Neos in your hand. If you activate CotH on Blazeman during your opponent’s turn, add another Poly to your hand. Then, once your turn begins, use Blazeman to send Shadow Mist to the Graveyard from your deck. Using that Shadow Mist’s effect, add V-HERO Vyon to the hand. You then effectively have any two Fusion Summons possible at your disposal. different end field and/or situation. I mentioned earlier that this deck is extremely ‘flat’, and what that term means is that you have a wide open pool of options. You have a lot of cards that search any HERO from your deck, a lot of cards that get you your Polymerization, thus you have all of the options in your Extra Deck available to you at most points of the duel. Another strong combo that did not come up in the examples but that I use frequently is Fusion Summoning out an Elemental HERO Absolute Zero, then using it as a Fusion Material for a second Fusion Summon. Not only will your trigger its effect to rid your opponent’s field of monsters, but you also have just setup for a Legacy of a HERO to resolve in the near future. This Spell card is insane – a straight +2 in card advantage – that is why I am harping so much on how important it can be. A +2 swing in advantage is sometimes enough to win a duel on its own, but if you manage to consistently achieve those sort of gains, your deck has a much greater chance of defeating your opponent’s. Mask Change – This has always been a great card ever since the HERO archetype was revolutionized by the 1-card Fusion Summons brought by Mask Change. Specifically, the Masked HEROes are just another set of omni-HEROes, just with their own Fusion Spell. The only issue I have with this card in a deck centered around the generalist HERO Fusions is that you quickly run out of space in your Extra Deck. Also, you cannot return the Masked HEROes back to the Extra Deck with Legacy of a HERO. Form Change – This tech is awesome, letting you change your Fusion Summoned Level 8’s into Masked HEROes. The only downside is that it returns the Fusions back to deck instead of the Graveyard… But we can’t be lucky enough to get everything we need. Elemental HERO Bubbleman – If you would like to invest more heavily into the R4NK portion of the Extra deck, Bubbleman will let you rely upon Xyz monsters more reliably. That being said, this sort of build is also less likely to have no other cards in hand, so he is a bit of a double sword. He also serves as another WATER to use as Fusion Material for Absolute Zero, but doesn’t bring too much more to the table outside of that. Parallel World Fusion – The other unique Fusion Spell for HEROes – effectively it is a reverse Miracle Fusion. While this seems like it could have potential, I personally have found this to not have any impact on the duel outside of returning a couple of banished HEROes. In my testing, the only time it was useful was to overcome an opponent’s Masked HERO Dark Law after he or she had already destroyed 3 attempts to attack over him. Half Shut – This card combines well with both Trinity and Ocean. Trinity for an easy OTK if your opponent ever leaves a monster in face-up ATK position, and Ocean to ensure that it lives through the turn in order to add back a HERO from your graveyard. Not the most elegant card, but it does have its uses. The Warrior Returning Alive – This card gives you a way to recycle your HEROes back from the Graveyard, outside of relying just on Fusion Recovery. Generally this is not a powerful option, but it is definitely something to consider. Cosmic Cyclone – Personally I find this to be the S/T removal of choice for HEROes. Quite frankly, Twin Twister may be a great card, but Fusion HERO cannot take the two card investment for removal before performing a Fusion Summon. Fusion Recovery and Legacy of a HERO only work once you have performed such a summon. Skydive Scorcher – The Signature Attack of Flame Wingman recently hit the OCG, and boy can it be powerful. As long as you have a Fusion monster, you can wipe your opponent’s face-up monsters straight off the field, as long as your Fusion has less ATK than their monsters. It even gives you some burn damage as well. This card can be awesome, even if you aren’t running Skyscraper. Which, to be clear, you shouldn’t be running even as a tech. As always, the list above is just my personal build. Fusion decks can be functional, and that can only get better as time goes on. Especially due to the new support, such as Fusion Recycling Plant that is being released to the TCG soon. See, you can never count out even the most anime-protagonist of decks. Until the next time, keep innovating and building creative decks! Most of all, just enjoy dueling for the fun that it can be! Reminder, I also take suggestions for future CDS articles! I really want to see some input from you! While I will not run out of cool ideas, I do want to be writing articles about strategies you are interested in. 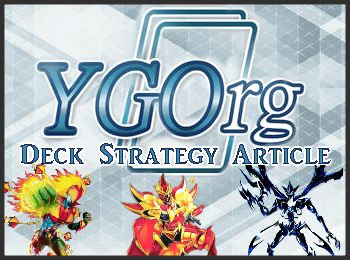 So if you wish to see a CDS article about the archetype, theme, or strategy you love, feel free to private message me on the YGOrg Discord server, the YGOrganization Forums, or just post a comment in response to this article on our Facebook page with your ideas to keep under consideration: my username is Quincymccoy and I promise that I do my best to read all of your suggestions and requests.